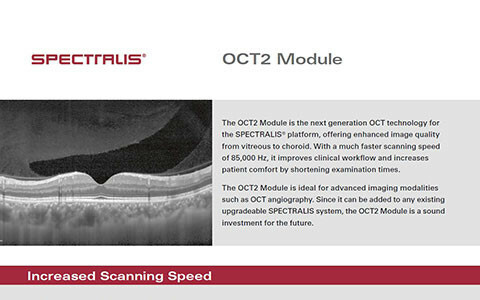 The SPECTRALIS® OCT2 Module is the next generation OCT technology for the SPECTRALIS platform, offering enhanced image quality from vitreous to choroid. With a fast scanning speed of 85,000 Hz, it improves clinical workflow and increases patient comfort by shortening examination times. 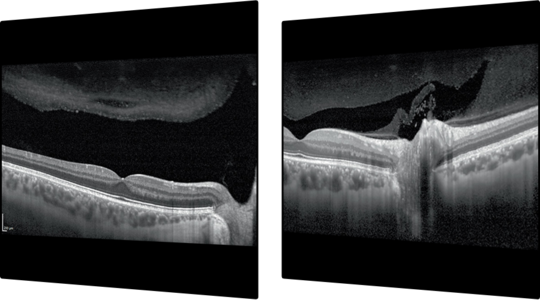 The OCT2 Module is the ideal basis for advanced imaging modalities such as OCT angiography and advanced glaucoma diagnostics. Since it can be added to any existing upgradeable SPECTRALIS system, the OCT2 Module is a sound investment for the future. The OCT2 Module is ideal for advanced imaging modalities such as OCT angiography. Since it can be added to any existing upgradeable SPECTRALIS system, the OCT2 Module is a sound investment for the future.